On Friday the 9th of March, trading on the EURUSD pair closed slightly down. The key event of the day for currency markets was the US jobs report (Nonfarm payrolls). Before its release, the exchange rate was hovering around 1.2305. 313,000 new jobs were added outside the agricultural sector in the US in February against a forecast of 205,000. The figure for December was revised upwards from 160,000 to 175,000, and for January from 200,000 to 239,000. This brings the aggregate revision to +54,000. The unemployment level remained at 4.1% (forecast: 4.1%). Average earnings rose by 0.1%, missing its target of 0.2%. The report shows reasonably high economic growth in the US. In reaction to this, the euro initially dropped to 1.2273 before recovering to 1.2334. By the time trading closed, the dollar had erased all its gains as traders paid close attention to the sluggish wage growth, which is an important factor for the Federal Reserve when deciding on interest rates. The euro received an additional boost from reports that North Korean leader Kim Jong Un is willing to hold talks with US President Donald Trump. This created an appetite for risk. The exchange rate recovered to the 45th degree from the 1.2273 low. This created an intraday reversal model. Since today is Monday and the economic calendar is virtually empty, I think that after a small downwards correction, the pair will continue to the 67th degree at 1.2356. It’s worth noting that the major euro crosses, except for the EURJPY and EURAUD, are trading up and providing support to the euro bulls. All this means that if the dollar continues to drop across the board, the euro could reach 1.2356 against it by the time trading gets underway in London. 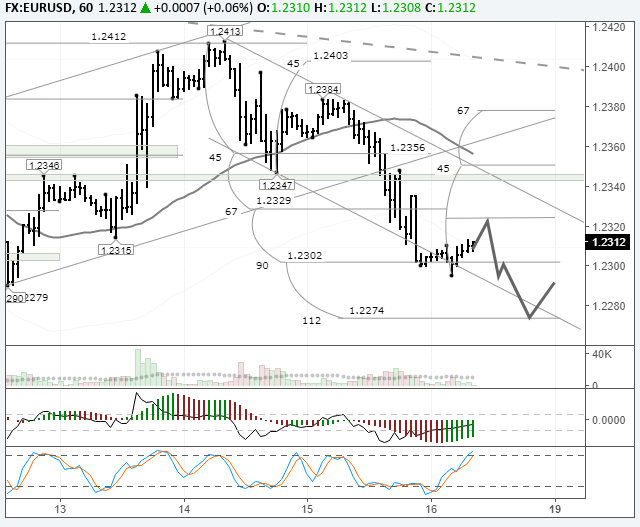 From here, I expect a downwards correction to 1.2318. Trading will look mostly flat today. On Thursday the 16th of March, trading on the euro closed down. The US dollar yesterday made gains against all the majors. Demand for it increased after the publication of US economic data. The US posted a rise in import prices, a decline in initial jobless claims, and a significantly higher-than-expected value on the Fed’s NY Empire State manufacturing index. Markets expect that the FOMC will raise interest rates by 0.25% next week. US10Y bond yields are currently trading at 2.83%. The end of yesterday’s session was met with the news that special prosecutor Robert Muller has subpoenaed Trump Organization documents in connection with the Russia probe. The first half of my forecast yesterday worked out perfectly. This all changed, however, after the breakout of the trend line. 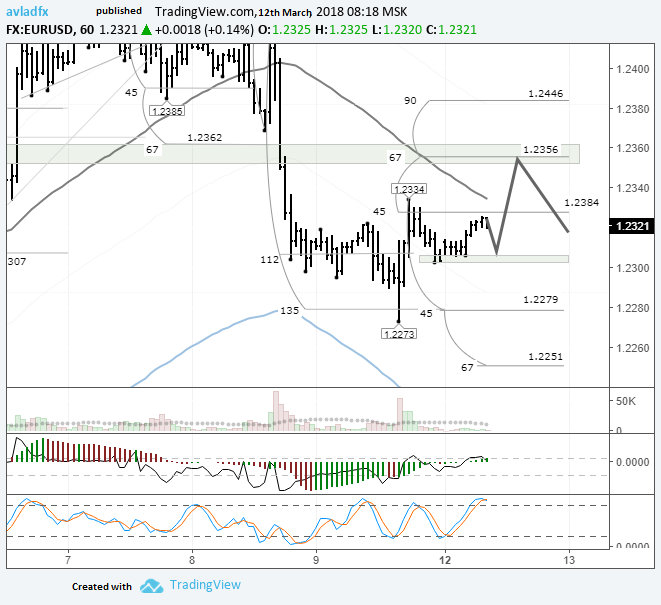 During the US session, sellers trading on the news managed to break through the horizontal support zone of 1.2340 – 1.2350, as well as the trend line from the 1.2273 low. The drop slowed down around the 90th degree. This isn’t a significant support level, so after a correction to 1.2324 (22 degrees), I’m expecting the euro to drop against the greenback to the 112th degree at 1.2274. 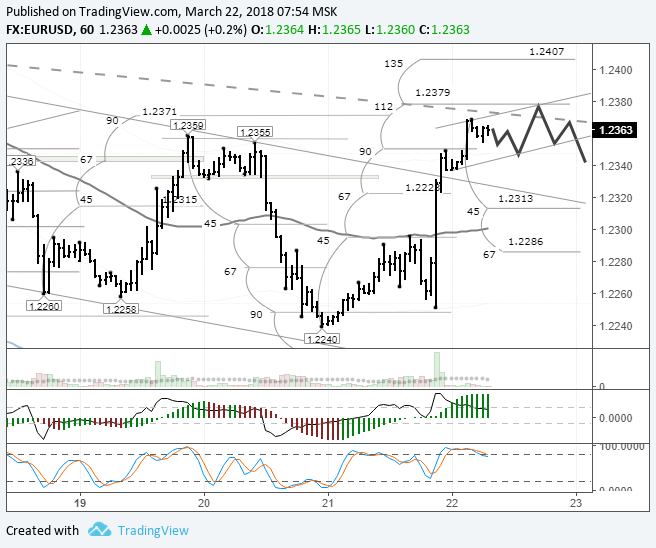 The trend line extended from the high of 1.2413 runs through 1.2450 on the current hour (9:00 EET). Here, it is being bolstered by the 45th degree. Given that trading in Asia today paints a mixed picture of the US dollar, and that most of the euro crosses are trading up, we can’t rule out the possibility of quotes rising as far as 1.2340/50. There’s a lot of news planned for today, which should keep market volatility high. It will be worth taking note of the Eurozone’s CPI for February during the European session. On Wednesday the 21st of March, trading on the EURUSD pair closed up. The single currency sharply rose following the FOMC meeting and the Fed chair’s speech. The FOMC increased the federal funds rate by 0.25% to 1.75%. In terms of the key rate, the Fed’s projection for 2018 remains the same at 3 rate hikes, while they revised their outlook for 2019 from 2 rate hikes to 3. Since yesterday’s rate hike had already been factored in by markets and investors were more worried about the number of rate hikes we’d see this year, the dollar slumped across the board in response to these projections. The euro recovered to 1.2350 and has hit 1.2369 in today’s Asian session. 11:00 France: Markit services PMI (Mar), Markit manufacturing PMI (Mar). 12:00 Eurozone: Markit services PMI (Mar), Markit manufacturing PMI (Mar), economic bulletin. 12:00 Germany: IFO – expectations (Mar), IFO – business climate (Mar), IFO – current assessment (Mar). 12:30 UK: retail sales (Feb). 15:00 UK: BoE interest rate decision, BoE asset purchase facility. 15:30 USA: initial jobless claims (16 Mar). 16:00 USA: housing price index (Jan). 16:45 USA: Markit services PMI (Mar), Markit manufacturing PMI (Mar). The FOMC disappointed dollar bulls yesterday by increasing the number of rate hikes in its economic projection for 2019, while leaving its projections for 2018 unchanged. As a result, the EURUSD pair returned to the daily trend line at 1.2369. Considering that yesterday’s high of 1.2369 has been reached in Asia, and hourly indicators suggest a declining euro, I’m expecting to see the rate drop to 1.2346. As most of the euro crosses are trading up, I’m expecting the 112th degree at 1.2379 to be tested ahead of the US session.